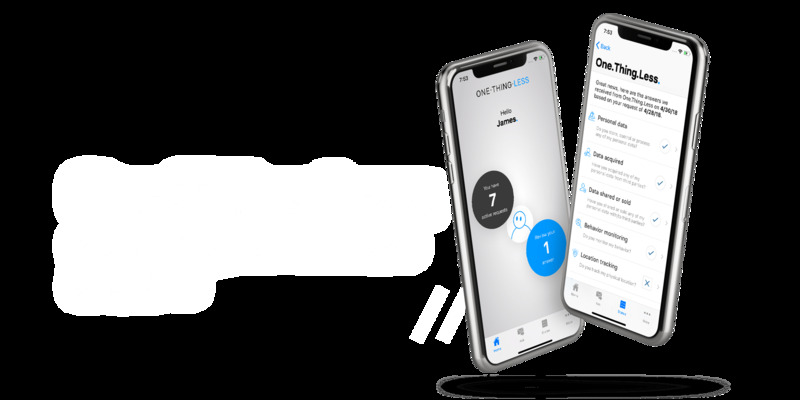 One.Thing.Less AG empowers and enables individuals around the world to regain control over their personal data in an easy and secure way. James Aschberger (Founder and CEO of One.Thing.Less AG) came to Liip with the dream to enable people all over the world to regain control over the use of their personal data, in one tap, and without the need to have a law degree, or hours of spare time to read through hundreds of pages of privacy policies! The hidden legal complexity about this product was huge, but James wanted Liip to create a one-click solution for the end user. It had to rely on a secure platform from end-to-end. It needed to be itself GDPR compliant — obviously. And it had to be able to scale quickly around the globe to comply with a “big-bang” launch. These were the requirements we got out of our first meeting with One.Thing.Less AG in January 2018. For all of our projects, no matter the company size, we always start by the end user. We use a well-oiled process for this called the “5S methodology” that contains five steps (all starting with an S, hence the name): Strategy, Scope, Structure, Skeleton, and Surface. Our main goal with this is to deep dive into the end user needs, and to understand the company business goals as if we founded it. We developed both iOS and Android apps using native technologies (respectively Swift and Kotlin) in order to ensure a smooth user interface. On the back-office and API sides, we went with Ruby on Rails which is our team’s web framework of choice for ensuring high modularity and development efficiency. All this relies on the infrastructure of Amazon Web Services (aka AWS). A choice that was easy to make when you look for a reliable, scalable, secure, and GDPR-compliant hosting partner that offers many plug-and-play services. As GDPR is a hot political topic, and because Apple has strict (and sometimes unpredictable) guidelines for its App Store, we didn’t want to risk to be rejected a few days before the launch date, killing the product even before it existed. We hence raised the deadline challenge: to push a pre-release version of the iOS app one month in advance. But thanks to techniques like User Story Mapping and MVP, we could create a prioritized roadmap that was satisfying both James and Apple (as the pre-release must be a fully functional product). And as we use Scrum on every of our projects — One.Thing.Less being no exception — we could deliver, test, and learn from a functional product every two weeks. We made it on time, one month in advance. In order to increase the trust in One.Thing.Less to help people take control over the use of their personal data, James decided to do a SOC (Services Organization Controls) audit by Ernst & Young. This was done in parallel of the ongoing design and development cycles. And it wasn’t a problem, as these extra-meetings went smoothly. Why? Because the framework provided by Scrum and our Liip tools are well structured and transparent. Even if it added some overhead, we see this exercice as a confirmation that we at Liip are on a good track when it comes to provide quality and trustful services to both our clients and end-users. Instead of trying to convince you about the result, we think it’s best if you can judge by yourself. Below are the main screenshots of the app workflow. If you want to have a deeper look, feel free to download the app. One.Thing.Less is a strong flagship product for Liip. For one because it represents well why we exist: to enable digital progress. And second, because it’s the perfect example of how we best embody our purpose: by establishing trustful partnership with our customers. We’re proud to be able to claim that “GDPR isn’t yet another complex law”. It’s now actionable to help you take back control on your privacy, with one tap. Once our idea was clear, the biggest challenge was to identify the right UX and technical team to bring it to life. Being a small startup, the chemistry needs to be right and the team mindset needs to be diverse. After meeting with Liip, I had a strong feeling about the team and their technical expertise, but most importantly also the right spirit and determination to bring this idea into a tangible product. 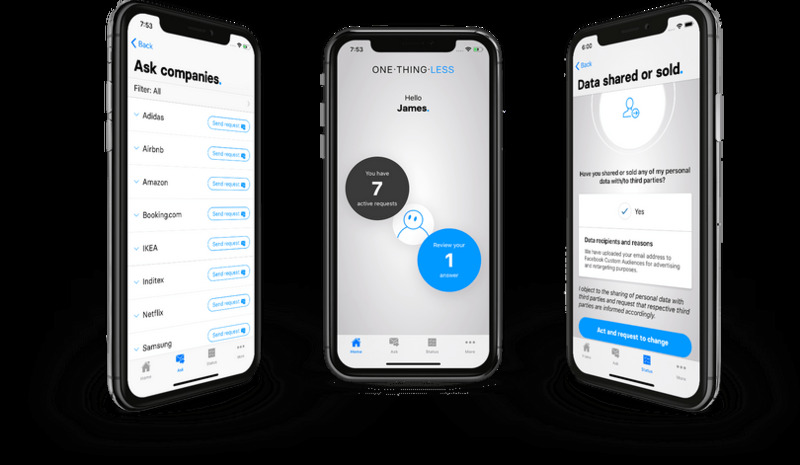 One.Thing.Less AG startup chooses Liip as digital partner to empower individuals around the world to regain control over the use of their personal data. One.Thing.Less went live on Friday 25.05.2018. 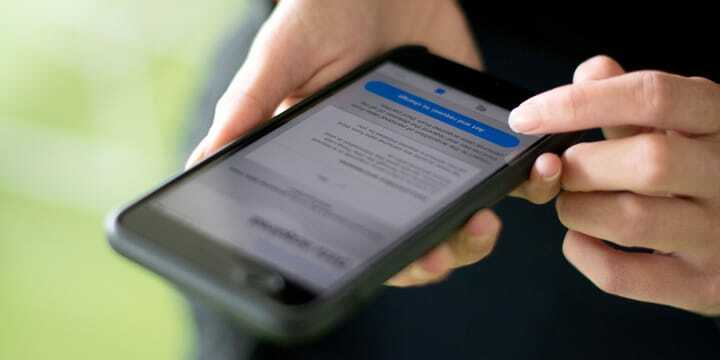 Finally an app to regain control over the use of your personal data made for you and me, not only law scholars. Download it now!